1. Preheat the oven to 180°C, gas mark 4. Grease 4 dariole or pudding moulds (about 150ml in volume) well with butter. Put the dried fruit in a large bowl and pour over 3 tbsp boiling water, then allow to sit for a few minutes to soak it up. 2. Pulse the remaining pudding ingredients in a food processor a few times, just until the mixture is smooth and fully combined (if you don’t have a food processor, you can do this with electric beaters or a wooden spoon). Scrape the batter into the bowl with the soaked fruit and mix together. 3. Divide between the prepared moulds and place on a baking tray. Bake for 15-20 minutes or until the puddings have risen and a skewer inserted into the middle comes out clean. in a small saucepan set over a medium-low heat, then stir constantly until melted and smooth. 5. Remove the puddings from the oven and immediately turn them out onto plates. 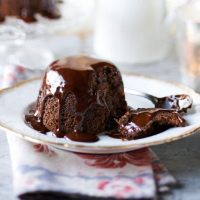 Pour the chocolate sauce over the warm puddings and serve. The puddings can be frozen for up to 1 month before baking. Freeze uncooked puddings in the moulds, wrapping well in cling film. Remove cling film and bake from frozen at 180°C, gas mark 4 for 35-40 minutes, or until a skewer inserted into the middle comes out clean.